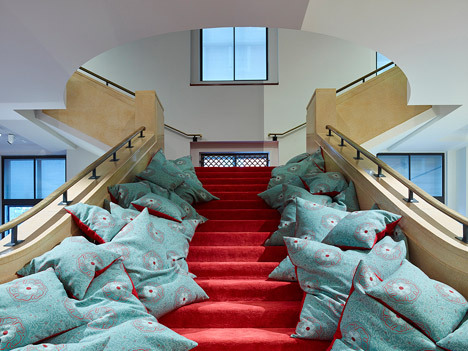 Architecture studio AOC has created an interactive gallery space at London's Wellcome Collection museum, featuring a grand stairway lined with cushions where visitors are invited to sit and read (+ slideshow). 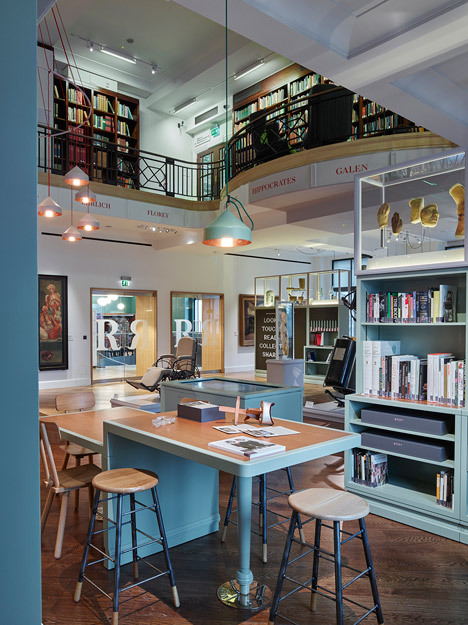 The Reading Room inhabits the second floor of the Neoclassical Wellcome Research Institute building on Euston Road, originally designed by architect Septimus Warwick. 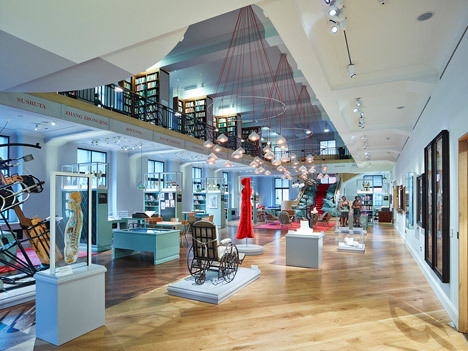 The double-height gallery houses over 1,000 books and 100 objects from the Wellcome Collection's archive of art and medical artefacts, in a 390-square-metre area that was once the Hall of Statuary – a room for exhibiting sculptures on plinths that AOC described as the building's "most dramatic space". 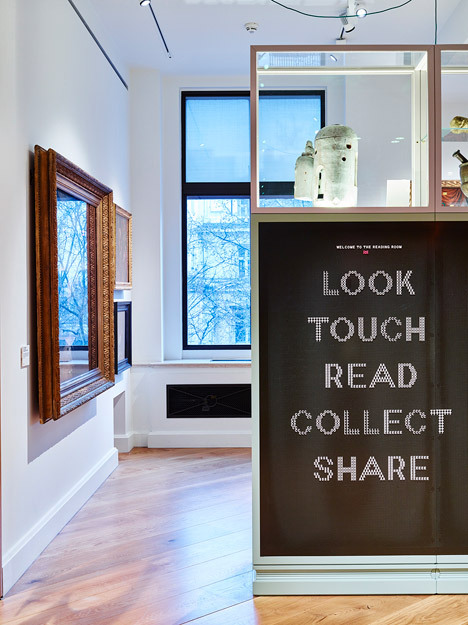 "Wellcome Collection were looking to create a new type of gallery that was physically and socially participative," AOC director Geoff Shearcroft told Dezeen. "They asked us to create a space that challenged the associations and behaviours of conventional gallery spaces and nurtured a permissive environment in which their visitors could engage with the collection in new and unpredictable ways," Shearcroft explained. To achieve this, AOC removed the partitions that had accumulated over the years and divided the space into two contrasting environments, each designed to encourage different levels of engagement from visitors. The grand staircase, which previously linked the gallery to a mezzanine library, has been converted into a seating area. "This captures the child-like delight of reading on the stairs," said Shearcroft. "The space is designed specifically for adults, providing them with the opportunity for exploration; rummaging through the collection, making new discoveries and sharing with their fellow visitors," Shearcroft said. 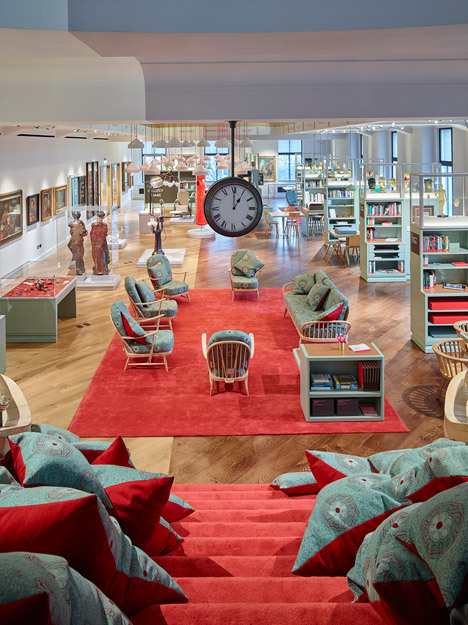 The room at the bottom of the stairs is divided into two areas, each based on past spaces used by the Wellcome Trust – a charitable foundation started by pharmaceutical entrepreneur Henry Wellcome in 1936. 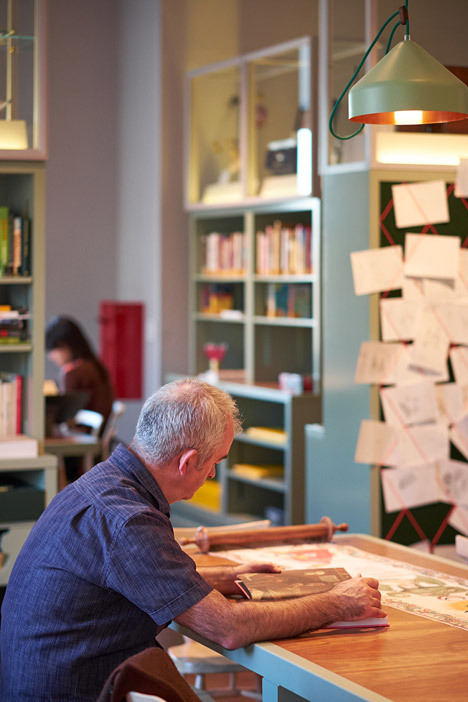 To the east side of the room is a traditional library space, with desks surrounded by a collection of artefacts displayed in cabinets and vitrines. 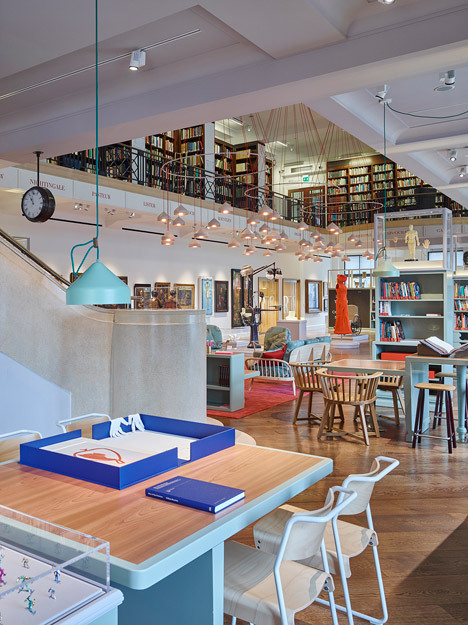 The dark timber floors are reminiscent of the Historical Medical Museum – Wellcome's first museum, which opened in 1913 on Wigmore Street, near to its current location, and closed in 1932. The gallery's 1930s incarnation as the Wellcome Research Institue's Hall of Statuary influenced the design of the west portion of AOC's interior. "White walls and a light timber floor create a modern 'white cube' gallery space for wall-mounted paintings and artefacts on plinths," explained Shearcroft. Colours are used in each space to encourage or deter interaction. A surgical green is used on the east side to suggest areas where guests can physically interact with the collection, while areas painted white and grey on the other side indicate the "do not touch" environment of a traditional gallery. "By literally juxtaposing these two contrasting environments the room actively encourages different levels of engagement with the artefacts – 'look, don’t touch' in the white cube, make yourself at home in the hall," said the architects. "The visible line where they meet divides the room, reinforcing the axial geometries of the grand stair whilst highlighting the asymmetries that break up the space." At the centre of the room, a carpeted area provides a space for visitors to sit and relax in. 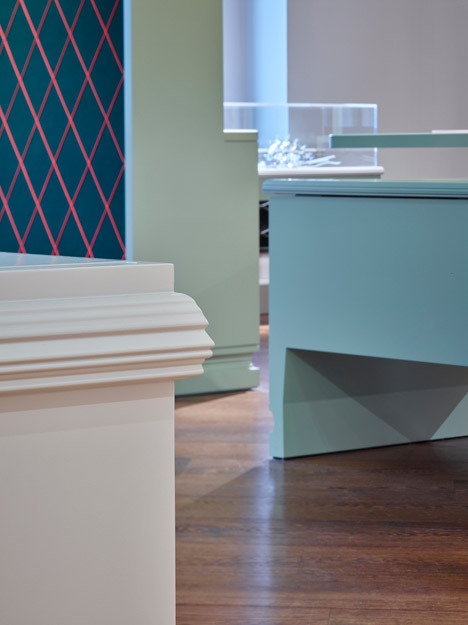 Bespoke furniture, including cabinets, vitrines and shelves, is arranged around the gallery to create "open niches" themed around parts of the collection. Tables topped with cherry veneer occupy the centre of each of these areas, with chairs for visitors to sit and engage with particular pieces. 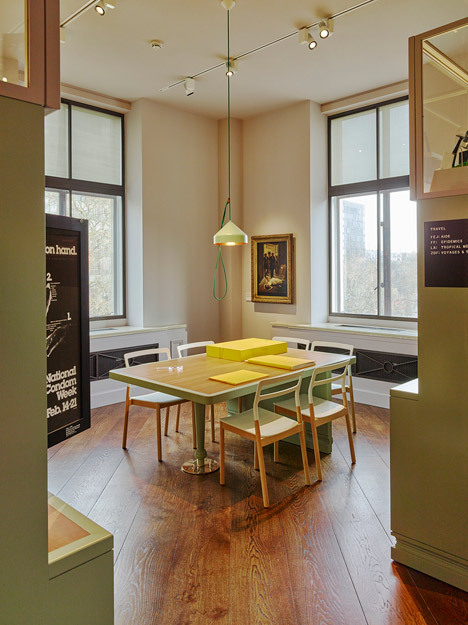 "A variety of table lengths, heights and supporting chairs and stools evoke the study desk, the dining table and the lab bench, encouraging visitors to interact with the artefacts and each other accordingly," explained the architects. 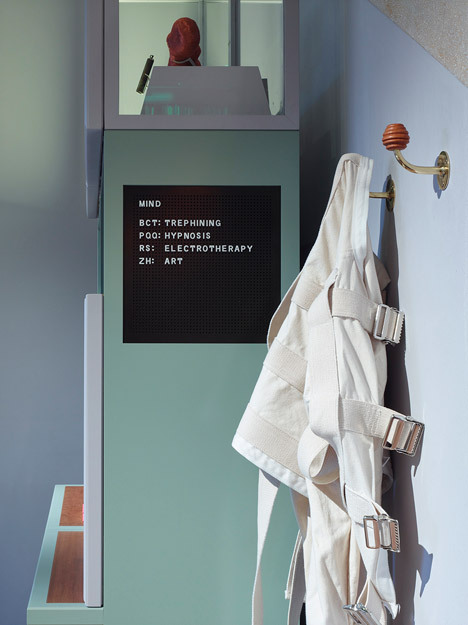 "The blank cabinet backs are memory surfaces, felt-lined memo boards and magnetic pegboards, for visitors to contribute to the room’s evolving conversation." 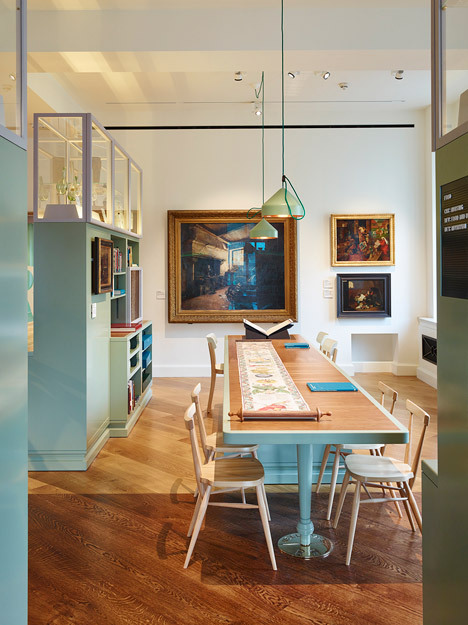 To reference the history of the Wellcome Collection, the profile of Henry Wellcome was replicated to create timber skirting, table legs and coat hooks. Other decorative details include a bespoke fabric developed in collaboration with textiles designers Camira. The pattern of the fabric is based on drawings of insulin made by the Nobel Prize-winning biochemist Dorothy Hodgkin in the 1930s.